It was time for maintenance on my new Nissan so that gave me some time to check the showroom at the dealership. I wanted to take a close look at the Nissan Rogue. It’s one of Nissan’s best sellers and gets great reviews. The outside looks very similar to my Nissan Murano. However the interior is more conventional. Perhaps a little more compact. Certainly not as many bazaar curves and slopes as the Murano. That’s good news from a mounting perspective. Lots of different places will work well in a Nissan Rogue but there were a few mounts and holders that simply won’t work. Especially the cup holders. We always try to have a photo of the interior accompany our vehicle specific articles. 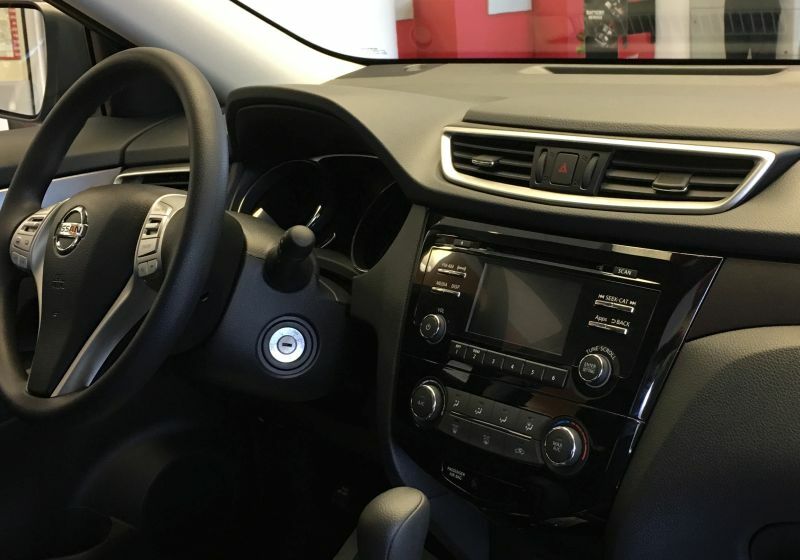 So a photo of the interior of the Nissan Rogue accompanies this article. I took this photo as the salesman approached me swooping in for the potential sale. Smartphones will work best in a Nissan Rogue with a windshield mount. My go-to mount for this location continues to be the Arkon MegaGrip Suction Cup Windshield and Dash Mount. The suction mount features a vacuum locked assembly attached to a pivoting arm. The phone can swivel into any orientation. The mount also comes with an adhesive disk that you can stick to the dash to turn the mount into a console mount. The suction assembly can adhere to the adhesive disk just like it would on a windshield. I use this mount personally in my vehicle and it works great. The same mount but for a Garmin GPS is the Arkon Windshield Dash Garmin Nuvi Suction Mount. I have recommended this one for many years and have used it myself. It’s an excellent mount that comes with a 2-year warranty. It’s more rugged and longer than the Garmin mount you received in the box. The vent mount is a good choice for this vehicle. Unlike my crazy shaped Murano, the Nissan Rogue has accessible vents that lack the radically extended lip beneath it. That’s good from a vent mount perspective. A vent mount for a Nissan Rogue must be slightly extended to fit properly though as there is a slight extension beneath the middle vents. The Square Jellyfish Jelly-Grip Car Air Vent Mount is a recent discovery of mine for the vent. The Square Jellyfish Jelly-Grip mount can be used to hold most smartphones or a Garmin GPS. All Garmin vehicle GPS devices made over the past ten years include a custom cradle that has a 17mm socket on the back. Remove the cradle from the Jelly-Grip mount and you have a 17mm ball. Just snap the Garmin cradle onto the Jelly-Grip mount without the cradle and your GPS can be mounted to air vent. The Jelly-Grip has a slight extension to it. This will sufficiently clear the slightly extended lip on the Nissan Rogue. A car seat bolt mount will not work on a Nissan Rogue. Like most, if not all Nissan vehicles, the seat bolt isn’t easily accessible. While you can use the option to bolt it directly to the floor board, most are not going to want to drill holes into their vehicle’s floor, so we will avoid these. The Nissan Rogue dash is surprisingly shallow. The vent insertion is set back within the dash removing dashboard real estate normally found in an SUV. It’s so shallow, that most dash mounts aren’t going to work very well in this vehicle. This is typically my go-to location for a small to midsize tablet mount. Unfortunately, there aren’t any good locations for a tablet in this vehicle. A CD player mount is going to work just fine on the Nissan Rogue. We like the Mpow CD Slot Mount for SmartPhones. Be sure to follow the included instructions for a secure fit. The included cradle opens to 3.4 inches and swivels into any orientation. The cup holder location is set far back on the Nissan Rogue. Depending upon where the driver’s seat is positioned, it’s potentially located behind the driver. That removes the cup holder from consideration. So in summary, the Nissan Rogue supports many of the traditional mounting locations including the windshield, vent and CD player. However, the seat bolt, cup holders and even the dash make poor locations. A smartphone or GPS have several homes in a Nissan Rogue, Unfortunately, tablet owners will have a tough time.